On the latest Adventure Time, “The Cooler,” Flame Princess seeks Princess Bubblegum’s help when the Fire Kingdom’s core mysteriously cools, but nothing is as it seems with the pink and brainy patriarch. It’s a tale of assured mutual destruction and inter-kingdom intrigue, one that asks why we permit our rulers to commit the unthinkable. It’s the eponymous time again! Adventure Time has been known to tug the heartstrings, but few episodes inspire an ironic despair the way “The Cooler” does. The episode sees all the foreshadowed darkness in Princess Bubblegum come to light, as the candy matriarch’s reactionary attitude towards safekeeping the Candy Kingdom begins to encroach on the neighboring Fire Kingdom. As an episode about the increasingly globalized power-structure of Ooo, it embodies many contemporary anxieties about the international community, including the necessity of surveillance tactics, and the difference between preemptive strikes and imperialist interference. But what lingers long after the episode comes to its idyllic close is that though the intrigue between Flame Princess and Princess Bubblegum mirrors real-world tensions, their solution, which is so simultaneously human and sensible, is so bleakly impossible in our own world. “The Cooler” sees Flame Princess in full bloom as the decisive ruler of the Fire Kingdom, with a dandy new costume and a seat at the head of a Dr. Strangelove-like cabinet of advisors, including her babied baby brother Randy, and her aunt and brother, who insist on hugs and bombings respectively as solutions to the Kingdom’s mysteriously cooling core. The episode is full of these precariously poised opposites that recall the mad parodies of Dr. Strangelove, and the sense that the fate of all our ‘civilized’ nations are in gambling hands. Normally the wackiness of Adventure Time personalities delights, but when the subject matter hits so close to home, the notion is almost too terrifying to bear. On the brink of destruction, Flame Princess reluctantly calls on Princess Bubblegum, and once they’re standing side by side we can see how diametrically opposed they are: where FP is an emotionally unstable character who rules over a warlike populace through open trust, PB is a composed brainlord that keeps her docile populace pacified through misdirection and constant surveillance, ever since that fateful first episode where she and Finn hid an incoming zombie invasion from the delicate Candy Citizens, lest they (literally) explode with fright. And this also just goes to show how drastically Bubblegum has changed, from the object of purity and romantic interest to a Superpower of ominous intent. Upon arriving in the Fire Kingdom, Princess Bubblegum makes a point of being as amicable as possible to Flame Princess, trying to swap first names and relate over how hard it is to lord over what she calls “subservient dummies,” a disturbing phrase, as PB’s one unassailable virtue is her selfless devotion to her people. If you recall the episode “James,” PB doesn’t seem to regard candy lives as equivalent to others, and even though that’s logically reasonable, as candy people are replicable in the lab (which is why she sacrificed James the ice cream sandwich to save herself, Finn, and Jake), it still suggests a chilling conclusion: if the Candy people are negligible, then the Candy Kingdom that PB is working so selflessly to preserve is just an extension of herself. And all this posturing, of doing ‘whatever it takes’ to keep the Kingdom safe, is nothing more than self-aggrandizement. Flame Princess reluctantly allows PB to investigate the holiest of Fire Kingdom holies, the hall of the Sleeping Fire Gods, which houses ancient, extraterrestrial machines possessing enough firepower to create a new fire kingdom elsewhere, should the need arise. This is the mecca and hope of Fire Kingdom culture and the subject of Flame Princess’ lullaby—and it’s all meaningless drivel to Princess Bubblegum as she stalks from giant to giant, stealing the cores from the machines even as a fellow Princess sings aloud her nation’s most vulnerable secret. Bubblegum’s theft is exposed, and in the ensuing battle, most of the fire giants are destroyed, and the Princesses lay all their cards on the table: Flame Princess is sick of having her kingdom and all the other “little people” endure Bubblegum’s constant policing; PB knew about the power of the fire giants and couldn’t run the risk of having FP’s warmongering brother take matters into his own hands, but beyond that, it’s because she believes that FP herself is a “dingus.” As we’ve never seen the equal of Bubblegum’s judgment or ability, it follows that everyone on Ooo is a dingus to be pacified for the Candy Kingdom’s safety. Bubblegum’s reactionary attitude antagonizes all of Ooo, and highlights just how outdated that notion is, of the political leader willing to go to any measures, make any sacrifices for the good of her protectorate. While this may have been admirable in simpler times, when it was the Candy Kingdom battling outright antagonism from either the Lich or Maja, on the global scale it becomes untenable to sacrifice the well-being of one population for the good of another. But to charge Princess Bubblegum isn’t an easy feat either—we watched Flame Princess’ brother slamming his fists on the table at the Fire Kingdom thinktank, with every blow reiterating “BLOW-UP-THE-CANDY-KINGDOM,” something that he’s been saying for months apparently, long before the crisis of the cooling core. He has an unfathomable bias against the Candy People (to quote: “They are TRASH people…”), and aside from the threat he poses, it should be remembered how conniving, untrustworthy, and to use Flame Princess’ own terminology, how “Shakespeare” everyone in the Fire Kingdom was before her reign. This all begs the question: exactly how out of line is Bubblegum, if at all? The battle ends in a draw, and Princess Bubblegum admits that she had Ice King cool the core with his frost powers in order to necessitate her own aid, and gain entrance into the Hall of the Fire Giants. Then Flame Princess utters probably the most profound line in the episode: “You’re cold, PB… and it’s not because you’re a scientist or a leader, it’s because you are a bad person.” It’s a line that resonates because it rails against the idea that we can dismiss the actions of our own leaders because of their position of high responsibility, or the necessity of their objectivity. While difficult decisions are a fact of life, to deny our own agency and the weight of our consciences is to condemn us to the fatalistic labyrinth of mechanized politics and paranoid brinksmanship, and close the door on everything we ever hoped to believe about human potential, or the mutability of destiny. Princess Bubblegum relents, and agrees to leave the Fire Kingdom with a single Fire Giant in order to prove to FP that she isn’t a bad person. The Fire Giants’ distinctive design seems styled after the work of famed comic book pioneer Jack Kirby; his narratives melded mythology and science to depict interstellar gods of advanced science and culture, and always took on this epic, prophetic voice regarding man’s greater cosmic destiny. Kirby was preoccupied with this idea of man’s origin, purpose, and even his salvation as coming from the stars, and consequently the Fire Giants represent the hope of transcending these base, pitifully human conflicts. It’s also a reference to the Greek myth of Prometheus, who risked the wrath of Zeus to elevate man above his savage beginnings towards greater sentience and purpose through the metaphorical gift of fire, similar to the legend in FP’s lullaby, in which the Fire Sentinels rained down from the sky to light a candle in an ancient era of fear. 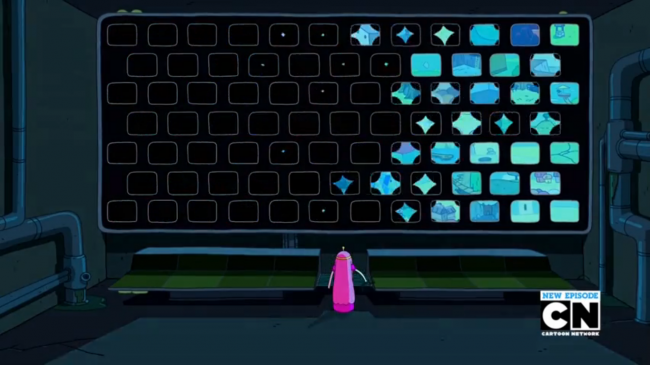 The episode closes with Flame Princess presiding over her celebratory subjects, then the screen shifts to Bubblegum in identical pose, but alone in the glare from the television wall of her surveillance room, in a nice juxtaposition of their starkly contrasting ruling methods. The TV-plex is a visual motif we’ve seen in dystopian graphic novels like Watchmen and V for Vendetta, with Bubblegum in place of Ozymandias, or the fascist Mr. Susan. She surveys her vast network of camera installations, and pauses on one screen in which Finn and Jake are singing the song from “Food Chain,” “…round and round as nature flows / It’s like one big ring…” If you’ll recall, that episode was a carnival-esque depiction of incarnation, of the lack of a true evil in the world as all are connected in chains of necessity and natural urges. It may be that Bubblegum is surrendering her insane hopes of an undying Kingdom, as an unnatural, unstable dream in a reality built on cycles of progress and destruction, of unceasing change. She pulls the plug on her spy network and locks the surveillance room behind her, but the absence of her watchful eye brings unease rather than closure.